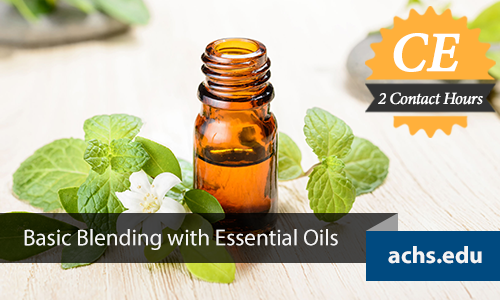 In this on-demand aromatherapy course, you'll learn the basic concepts of aromatherapy blending with ACHS Aromatherapy Department Chair, Amanda Lattin. Amanda Lattin, BA, MAT, Dip. Aroma., MH, RA is a professor and the Aromatherapy Department Program Chair at ACHS. She is an experienced aromatherapist, herbalist, and teaches extensively throughout the Pacific Northwest. Amanda is a graduate of ACHS and also holds a BA in Chemistry from Huntingdon College and a Masters of Teaching with a concentration in Chemistry from Lewis and Clark College. Continuing education is vital for all professionals to stay up-to-date with industry advances. In addition, most professional organizations—from the Florida Board of Health to the Oregon Board of Naturopathic Examiners—require continuing education (CE) hours to ensure regulatory compliance, educational rigor, and the highest standards of practice. ACHS offers a wide range of online CE opportunities in integrative medicine and holistic health to help meet your CE requirements and thirst for learning! For a list of current continuing education provider approvals, click here. As an accredited college, many organizations accept ACHS CEs. Please check whether specific approval is required with your professional body. If you are interested in having your professional organization approve ACHS CEs, please contact ACHS CSO Erika Yigzaw at ce@achs.edu. • Register and pay the $25 CE processing fee. • Watch the video (approximately 120 minutes). • Take the short CE multiple choice question assessment and successfully achieve a score of 80% or higher (you'll have two attempts). This demonstrates you have mastered the course learning outcomes above. • Your CE certificate of completion is emailed as soon as you successfully complete the assessment. To get started, click the blue "Start" button up top.